Through energy generation and energy conservation, CUC aims to become the first 100% renewable energy university in Japan with regard to electricity in 2018, and with regard to all energy, including gas, in 2020. 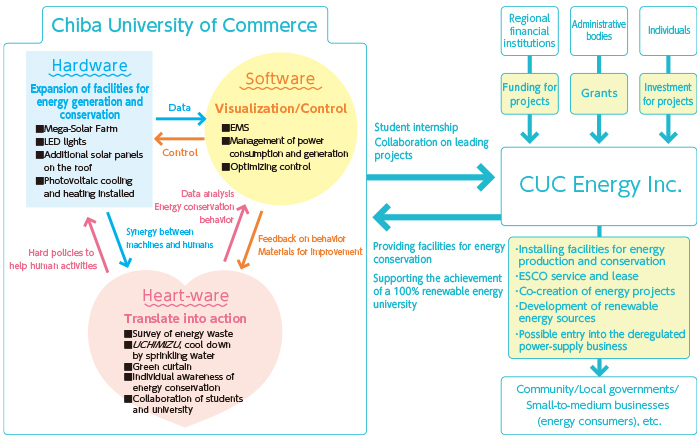 To acahieve its environmental goals, CUC is promoting, with its past activities to tackle global warming at the core, a university-wide scheme based on the three initiatives of hardware, software and heart-ware. Through these initiatives, CUC aims to make this a model case for the local production and consumption of energy and support the establishment of a decentralized energy distribution society for the local community.